Throughout history, the scarecrow has been a figure or effigy made of found materials to ward-off the incursion of unknown and unpredictable threats. Through ceremony, they are imbued with a collective soul of the community to have the power to conjure mystery and warning to all that approach. For this year’s Nuit Blanche North, artists Thom Sokoloski and Jenny McCowan created three 18-20ft. 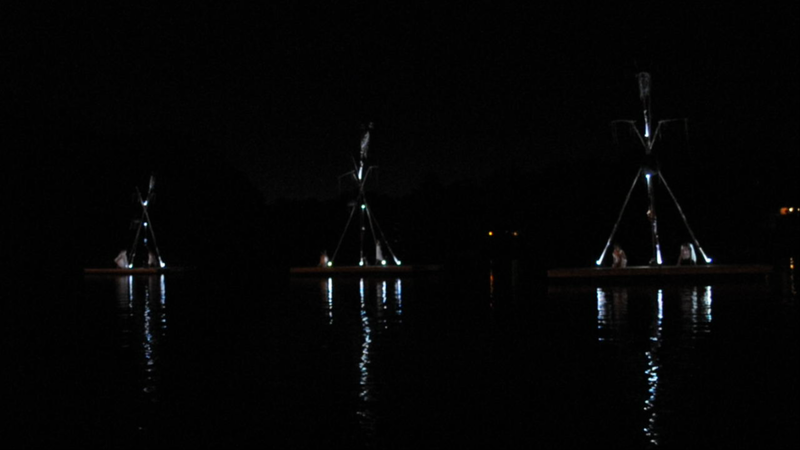 tall Scarecrows, representing earth, wind, and water, which resided on floating docks in the Muskoka River to protect the spirity and beauty of the Muskoka/Parry Sound Region. To achieve the collective soul of the Scarecrows, the artists invited the community to participate in the making of spirit bottles. 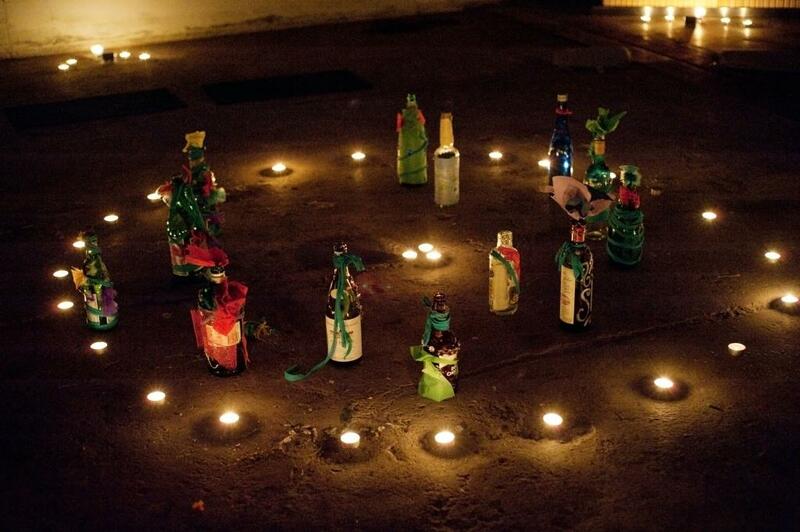 The inspiration for the spirit bottles came from the long history of how bottles have been used as containers for spirits, messages, stories, ex-votos and outsider art, etc. They were often used as offerings and/or protective amulets created for divinities, holidays, incidents, lost friends or anything else the maker had in mind. In each case, the design arose out of a personal relationship with a story and the selected materials integrated into the bottle’s expression. On the night of Nuit Blanche North, those who participated in the creation process, brought their spirit bottle to the docks where they were chauffeured by canoe to the Scarecrows of Earth, Wind and Water to hand-over their spirit bottle in a ceremonial exchange with a dance guardian. The first stage of development of Scarecrows took place in August 2012 in New York City at Socrates Sculpture Park. The artists looked at the park as a farmland for creativity and were inspired by individuals who contributed to the creative, inventive and artistic spirit of Queens, New York. Each Scarecrow was empowered by the images, stories and motivations of their past as a vision for the future.